Sadly this isn't a review of a Christmas dinner, although I'm sure a lot of you would be delighted at the prospect of not having to cook one! 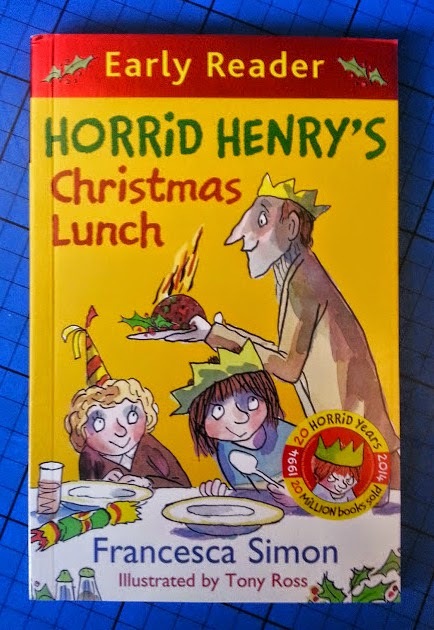 Horrid Henry's Christmas Lunch, as written by Francesca Simon and illustrated by Tony Ross, is one of the latest releases from Orion books. 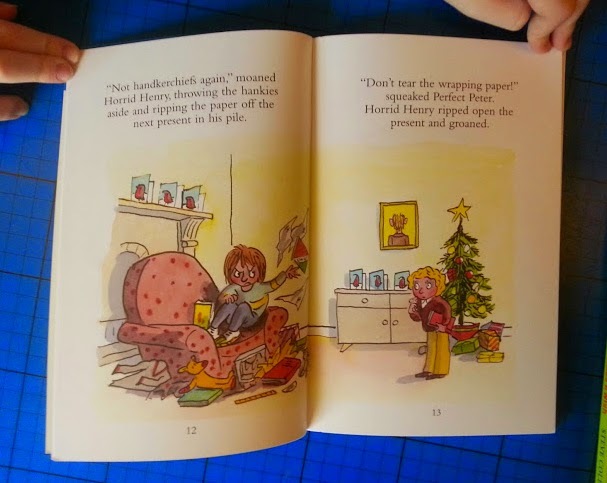 Horrid Henry's Christmas Lunch is a Red Band Early Reader, and ideal for those who are starting to read independently. My 6 year old can just about read this to himself, and the format is perfect for him with wide spacing, easy and repetitive langauge, and plenty of great illustrations. The first Horrid Henry book was published 20 years ago, and he has sold over 20 million books. We have several and my children have always enjoyed them - and this is no exception. This book is also the 100th in the Orion Books Early Readers series - many of which we've also reviewed. Henry really does start out thoroughly horrid and ungrateful in this book, which shocked my 4 and 6 year olds. His bad manners and rudeness don't get him anywhere though, and as with all good children's books, he does save the day in the very end when Christmas lunch goes horribly awry. A lot of Horrid Henry's Christmas Lunch is showing what people got each other for Christmas, some of the gifts are hilarious and they're nearly all innappropriate or badly thought out, and my boys got a lot of pleasure from reading about it. Hopefully they might have learnt something too! This is a lovely book. It's incredibly interesting and easy to read, but introduces some trickier words (frazzled and slithering for example), keeping the reader on their toes. It's a book for re-reading, and is full of intonation and expression - great for a child who is becoming more confident with spelling and is beginning to have rhythm in their reading. 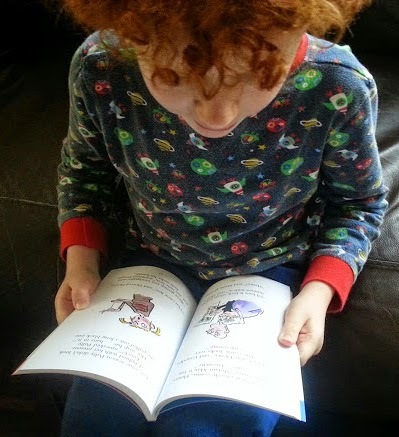 Horrid Henry's Christmas Lunch has 80 full colour pages and a recommended price of £4.99. Available from all good bookshops or online from Orion Books (where you'll find the other 99 Early Readers!). I dont really mind what we have as long as I get to spend it with my family. Pizza would be quick & easy, allowing me time to play with the children & their new toys. We always have a traditional turkey dinner on Christmas day and I wouldn't want anything else! i would still have turkey, it's my favourite! Traditional turkey and trimmings,devils on horseback. My husband usually makes a fabulous french onion soup for starters (though last year he tried making it with lager-it was horrid) Homemade trifle for afters and a good cheeseboard! Always the traditional turkey dinner here, wouldn't seem like Christmas without it! Turkey with all the usual trimmings and a lovely pudding. chips n curry sauce .... but we having turkey ! A lunch cooked and cleared up by someone else! chicken and loadssss of spuds! Probably a selection box or 3 but we will be sticking with the traditional xmas turkey/chicken dinner!!! Oooodles of turkey and stuffing! Love a traditional Christmas meal but heaven would be someone else planning and cooking and serving it! I just need to turn up in my gladrags! Has to be turkey with all the trimmings!